A key and unique element of Michigan’s auto insurance laws is that it provides no limit to the benefits provided under personal injury protection, or PIP. PIP benefits cover the cost of medical and medical-related expenses incurred from treating injuries sustained during an automobile accident. They include a wide range of treatment and care, such as expenses for hospital services, modifications to homes, transportation, in-home attendant care, lost wages, occupational rehabilitation services and even funeral services and survivor benefits. Only the 12 states that use a no-fault system like Michigan mandate that insurers provide PIP coverage to each insured driver. But all states except Michigan limit PIP benefits. In fact, the second-most generous mandated PIP coverage exists in New York, where drivers must purchase $50,000 worth of PIP coverage. Most of the other no-fault states require PIP coverage of between $3,000 and $40,000. These essentially unlimited benefits are contributing to the high costs of auto insurance premiums in Michigan. The Insurance Institute of Michigan hired Michael Miller of EPIC Consulting, LLC in 2007 to estimate what the impact would be on premiums if Michigan capped PIP benefits. Miller projected premiums to fall by 9 percent if PIP was capped at $400,000 and 16 percent if capped at $50,000. This would translate to hundreds of dollars in savings each year for all insured Michigan drivers. Miller also analyzed more than 70,000 past PIP claims made in Michigan and found that the rare, extremely expensive cases were the main drivers of PIP costs. For instance, Miller reported that 94 percent of claims were for under $50,000 and these claims accounted for only about 22 percent of total PIP costs. Claims of $400,000 or more, on the other hand, represented only 0.5 percent of all claims but were responsible for 43 percent of total PIP costs. This suggests that while every driver pays the cost of unlimited PIP coverage, only a tiny fraction of people injured in car accidents benefit from this generous provision. 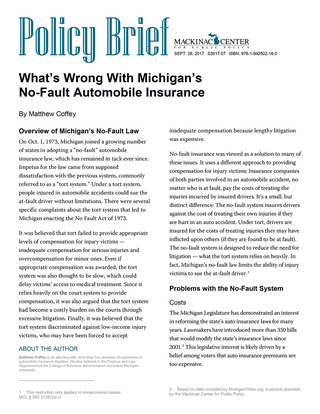 Sharon Tennyson of Cornell University studied Michigan’s no-fault auto insurance system in 2011 and compared its outcomes to those in other states. She found that, largely because of unlimited PIP benefits, Michigan’s average claim in 2010 cost $35,446. This was more than double the second highest no-fault state’s average, which was New Jersey at about $16,000 per claim. The average claim costs for all the other no-fault states, not including Michigan, was under $10,000. These data and analyses suggest that Michigan’s unique approach to providing no cap to the benefits of PIP coverage is a key driver of the rising costs of auto insurance premiums in this state. JC Reindl, “No-Fault Fixes? How Other States Reined in Auto Insurance,” Detroit Free Press, May 9, 2017, https://perma.cc/E6NM-PP2G. Michael J. Miller, “Private Passenger Automobile: Analysis of No-Fault Legislative Reforms” (Insurance Institute of Michigan, June 2007), 4, https://perma.cc/AZX5-CX4A. Sharon Tennyson, “The High Costs of Michigan’s No-Fault Auto Insurance: Causes and Implications for Reform” (Michigan Chamber of Commerce, April 22, 2011), 6, https://perma.cc/3DXE-5QUR.